as well as of anyone looking for a high quality water in stylish packaging. 1 L: provides elegant look on the table due to its sleek shape. 500 mL: perfect for on-the- go consumption. 330 mL: practical pocket format, also convenient for children. 250 mL: perfect for bar and hotellerie sector is also a practical pocket-sized. Also convenient for children. The unique refined taste of Dolomia still mineral water is well combined with the style and personality of the packaging. 330 mL: practical pocket format, also convenient for children*. 250 mL: perfect for bar and hotellerie sector is also a very practical pocket-sized. Also convenient for children. 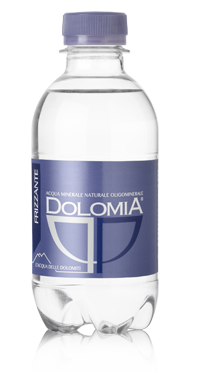 (* Dolomia in still version has also been approved for the newborns – by decree of Italian Ministry of Health (dated July 25, 2008) “Dolomia, low concentration mineral water, can be used for the preparation of baby food”). Pleasant effervescence and elegance combined. 250 mL: perfect for bar and hotellerie sector is also a very practical pocket-sized.